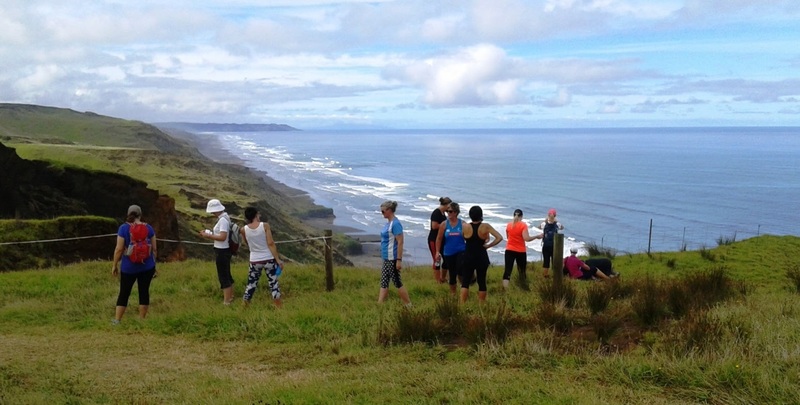 A total of 470 visitors took part in Waiuku Rotary’s Sunset Coast Walk this year, some coming from as far away as Waiheke Island. Considering the previous day’s weather forecast for heavy showers, (which thankfully did not eventuate), this was considered an excellent turnout. The route of the walk encompassed an ever changing vista of the west coast, to the north as far as the eye could see, and to the south with breath-taking views over Karioitahi towards the Waikato River. Many walkers, on their return to base commented that the views this year were the “very best”. In planning and preparing for the walk a small group of Rotarians were involved in choosing the various routes for the walk which were carefully surveyed to avoid any major hazards. On the day prior to the walk all the base and route tents were thankfully able to be put up in fine weather. Contrary to forecasts, Sunday morning dawned fine. The first registrations took place around 7.30am, and the morning soon became very busy with many groups of families, sportspeople, friends and individuals setting off armed with maps of the various routes available. The Waiuku Scouts group manned the free sausage sizzle and drink tent throughout the day, and also very ably helped direct the many cars into the parking spaces. It was good to see the involvement of the young people. Special thanks to Franklin Vets for the use of their Mobile BBQ. Many participants brought picnic lunches with them and with the lovely shade trees around, it was an ideal time to relax and create a happy atmosphere. The local Coffee Van was available for that very welcome cup of Coffee throughout the day, and they donate a share of their profits to help with our fundraising. The Club sincerely thanks the owners of the property, John and Andrea Sturgess for their continued support in allowing their farm to be used for this annual fundraiser. The Club also wishes to acknowledge and thank sponsors who continue to support this fund raising project; Waiuku New World, Pukekohe Harcourt’s Real Estate, McConnell Stafford-Bush and NZ Steel. They have over the years been extremely generous in supplying Waiuku Rotary with goods, donations, and loan of tents. All funds raised will be used for local projects, particularly those supporting the youth of the district.